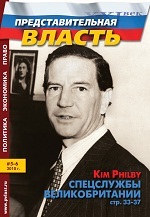 The main topics of Issue 5-6, 2010 of the "Representative Power - Century 21" magazine include articles by V.Krasnov on the role of The Great Duke M.Romanov in development of Russia's constitutional system and by V.Melnikov - on contradictions of the legislation on formation of the Federation Council. Abstract. The article treats the only official act issued by Grand Duke Michael (Mikhail Aleksandrovich Romanov) in response to Tsar Nicholas II’s abdication in his favor on Mach 15, 1917. Contrary to a tendency to dismiss it as “yet another abdication,” the author argues that Michael’s Manifesto was in fact an octroi constitution that granted the Russian people (1) the right to decide on the form of government, and (2) introduced to Russia the broadest, most democratic electoral laws anywhere in the world. The Bolshevik coup d’etat on November 7, 1917, ended the Russian experiment with democracy, and on January 17, 1918, the Bolsheviks dispersed the Constituent assembly elected according to Michael’s Manifesto. On June 12, 1918, they got rid of its protagonist who was killed in the outskirts of Perm. Abstract. The article examines actual problems of security of elections in North Caucasian federal district. The authors study election campaigns 11.10.09 in Dagestan, Ingushetia, Chechen Republic and Karachaevo-Circassia and show their importance for the protection of constitutional order. Abstract. The article is devoted to the political conflict management problem. It substantiates the notion that, besides negative side, conflict also possesses positive one, being natural instrument of social contradiction solution. As a social process, political conflict is characterized by manageability, i.e. sensitivity to external organizing influence. Meanwhile, conflict management does not necessarily boil down to its prevention or settlement, as, depending on the circumstances, political goals of the subjects of management may also be best achieved in case of conflict initiation or escalation. Abstract. The idea of article is the developing discussion about legal essence and appointment procedure of Council Federation as the Region Assembly with European Parliament considerations based. The legal status of Council Federation and the President of Russia authorities is one of the main topics of article. The author tried to discredit the appointment procedure of Council Federation based on the political party formation. The main topics of article are the drawbacks of federal law about the appointment of Council Federation; the potential legal consequences in case of enactment the appointment procedure of Council Federation based on the political party formation; the suggestions new forms and mechanisms responsibility of Council Federation members for state entities and society. Abstract. It’s the 20th anniversary of the contemporary constitutional process in Russia, if we start counting from adoption by the Russian Congress of People’s Deputies on June 16, 1990 of a resolution on creation of the Constitutional Commission. For three years the Commission worked on an official draft of the constitution. However, as known, on May 12, 1993 President Yeltsin issued a Decree “On Convention of the Constitutional Assembly and Completion of the RF Draft Constitution” and a normal constitutional process was derailed. The article contains historic and legal analysis of the main concepts and main principles of the mechanism of dissolution of the State Duma that were worked out by the participants in the Constitutional Assembly. Abstract. In the article the legal grounds of recognition of miscompetence of members of the legislative governmental body of a subject of the Russian Federation are investigated. Cases of premature cessation of authorities of deputies are analyzed. The comparative analysis of regulations of the Federal law “On the basic guarantees of electoral rights…” and the Federal law “On the basic principles of organization of legislative (representative) and executive governmental bodies of some subjects of the Russian Federation” is presented. Abstract. On June 2nd 2010 the State Duma adopted a bill «About modifying the Act “About detention of suspects and defendants within criminal procedure”». This bill was drafted in order to make Russian law consistent with the decision of Russian Constitution Court in regard with enhancing of legal regulation of encounters between suspects and defendants and their defense counsels. However this bill has in a technical sense significantly limited the work of lawyers in detention jails. Lawyers are being thrown back to the Stone Age. Instead of the modern gadgets they have to deal with a pen and a notebook. The law adopted by the Duma, prohibits the use of any technical devices while encounters with the defendants: laptops, video cameras, audio recorders. On the June 9th 2010 the Council of Federation rejected this bill. Senators considered the bill inconsistent with constitutional provisions establishing rights of Russian citizens to enjoy qualified legal aid. Abstract. The article is dedicated to recent British legislation dealing with special services, and attempts of British public to extend its control over the activities of special services. Interview with the Rector of the Transnistrian State University T.G. Shevchenko , Academician RAEN, Doctor of Physical and Mathematical Sciences, Professor of Mathematical and Physical Sciences Beril S.I. Abstract. The federal law « About modification in the separate acts of Russian Federation in connection with perfection of a legal rule of state (municipal) establishments » has specified the status of establishments, switching, state, budget, independent and privateestablishments. The given work has for an object the analysis of the legal status of scientific and educational establishments. Key words. legal regulation, an economic crisis, activity of the state, a measure of freedom, social intensity, technology of legal regulation, the international interaction. Abstract. Lause is devoted to research of the questions connected with legal regulation of public attitudes during an economic crisis. The special attention is given to a problem of the prevention of social intensity by use of rules of law for an establishment рамок (limits) of behaviour of subjects of the right in crisis conditions. Abstract. Legal statues of Russian citizens, who also has another citizenship (double nationality), in land relations is not clarified. Stated persons from one side are citizens of Russia and have unlimited right to accrue rights on land in Russia. From another side, they are foreign citizens, whose rights to accrue land are restricted. Suggested to provide persons with double nationality, who are residents of Russia, the same rights in land relations as Russian citizens, and for nonresidents same rights, as foreigners. Chernyshev D.N. International Lease of State Territory with the Goal to Facilitate Transportation. Abstract. Tendencies forming in the legal relations connected with the lease of state territory with the goal to facilitate transportation are analyzed in the article. Such relations on the railway emerge mostly in connection with foreign railway stations on the territory of a state. Eurotunnel is a special case. In the maritime transportation the lease is necessary to provide a land-locked state with the transit to the sea or with a pier in the sea port. Abstract. The mass media actions of illuminating the five-day war in South Ossetia on the august 2008 are analyzed in the article. Here are described the new possibilities of mass media and their use in war as an effective weapon of the 21st century. Abstract. Deputy mandate includes not only judicial but also moral and ethic content. According to the European Code of Conduct for local and regional elected representatives respect for deputy mandate goes hand in hand with respect for ethical standards. The European Code of Conduct for local and regional elected representatives contains standard rules of conduct for deputies. Deputies are expected to follow them in their work. The analysis of work of representative bodies in Russian cities shows that deputy ethics rules, adopted by them, comply with the European Code of Conduct for local and regional elected representatives.